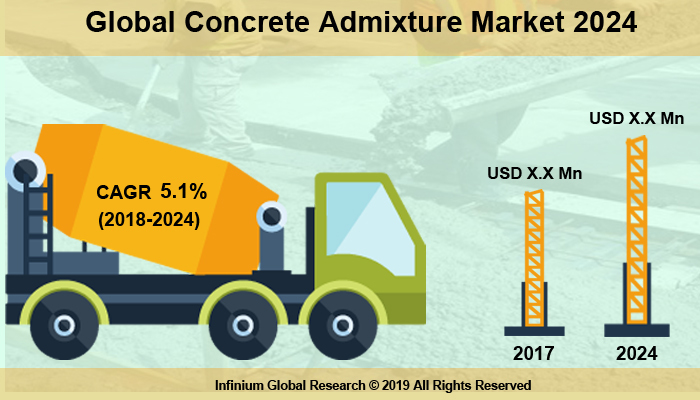 A recent report published by Infinium Global Research on concrete admixture market provides in-depth analysis of segments and sub-segments in the global as well as regional concrete admixture market. The study also highlights the impact of drivers, restraints, and macro indicators on the global and regional concrete admixture market over the short term as well as long term. The report is a comprehensive presentation of trends, forecast and dollar values of global concrete admixture market. According to the report, the global concrete admixture market is projected to grow at a CAGR of 5.1% over the forecast period of 2018-2024. The chemical ingredients added to the concrete to improve concrete quality, acceleration, manageability, and retardation of setting time are known as concrete admixtures. Admixtures reduce the cost of concrete construction, achieve certain properties in concrete more effectively, and maintain the quality of concrete during the stages of mixing, placing, transporting, and curing. The various types of admixtures available commercially are set retarding, air-entrainment, water-reducing, accelerating, shrinkage reducing, superplasticizers, and corrosion-inhibiting concrete admixtures. The development of the construction industry owing to the increasing population and the growing urbanization across the globe primarily drives the growth of the concrete admixtures market. The upgrading infrastructure and the ongoing maintenance activities to restore the aging architectural structures are favoring the growth of the concrete admixtures market. Furthermore, the increasing government and public investments in the civil engineering sector promote the growth of the concrete admixtures market. Several governments are highly investing in power, dams, bridges, roads and urban infrastructure development projects in the emerging nations. For instance, an investment of about USD 588 million has been made for developing a road stretch of 493 km in Bolivia. However, low awareness about additives and the high cost of these additives hampers the growth of the concrete admixtures market. Moreover, the current advancements in the infrastructure and the favorable government initiatives provide opportunities for the growth of the concrete admixtures market. The Asia Pacific dominates the global concrete admixtures market owing to the booming construction sector in this region. The growing industrialization and urbanization in the Asia Pacific countries such as China, Indonesia, India, and Malaysia are increasing the demand for concrete admixtures. In addition, the rising government initiatives such as housing projects and the growing foreign investments in India are anticipated to drive the growth of the Asia Pacific concrete admixture market. Furthermore, an increase in domestic engineering and construction companies in the Asia Pacific region favors market growth. North America also holds a significant share in the concrete admixtures market. The favorable U.S. government policies to support public works projects and the revival of bridges, tunnels, and roads promotes the growth of the North America concrete admixture market. Several other regions such as Latin America are anticipated to advance in the concrete admixture market owing to the improving infrastructure in countries including Colombia, Peru, Argentina, and Bolivia during the forecast period. The report on global concrete admixture market covers segments such as product type, function, and application. On the basis of product type, the sub-markets include mineral admixture, and chemical admixture. On the basis of function, the sub-markets include water-reducing admixtures, retarding admixtures, superplasticizers, and corrosion-inhibiting admixtures. On the basis of application, the sub-markets include residential, commercial, and others. The report provides profiles of the companies in the market such as Cementaid (UK) LTD, CICO Group, RPM International Inc., MAPEI S.p.A., CEMEX S.A.B. de C.V., Nevada Ready mix, Fosroc, Inc., BASF SE, and SIKA AG. The report provides deep insights into the demand forecasts, market trends, and micro and macro indicators. In addition, this report provides insights into the factors that are driving and restraining the growth in this market. Moreover, The IGR-Growth Matrix analysis given in the report brings an insight into the investment areas that existing or new market players can consider. The report provides insights into the market using analytical tools such as Porter's five forces analysis and DRO analysis of concrete admixture market. Moreover, the study highlights current market trends and provides forecast from 2018-2024. We also have highlighted future trends in the market that will affect the demand during the forecast period. Moreover, the competitive analysis given in each regional market brings an insight into the market share of the leading players.